This weekend at Twickenham, Scotland need their big men to step up and be counted - and they could do a lot worse than ask one of the smallest players in the squad for some advice on how to punch about your weight. The Scots head southwards battered and bruised, smarting from a Guinness Six Nations campaign that has seen them lose a number of players to injury and won just one of four outings.They have not won at Twickenham since 1983, but given he was not even born until 1997, that statistic will not be weighting too heavily on the mind of carefree flyer Darcy Graham ahead of Saturday’s match up. One bright spark in the 18-11 home loss to Wales last week was a try on his first international start by winger Graham while his overall performance was top class. When the 21-year-old signed for pro side Edinburgh Rugby from hometown club Hawick back in the summer of 2017, then acting head coach Duncan Hodge said he was “one of the most exciting prospects in Scottish rugby”. And less than two years later, he is quickly proving that Hodge was right. Two years ago Darcy Graham was playing club rugby for Hawick Rugby Club. Graham burst onto the Scotland under-20 scene during the 2016 Nations campaign and played his part as the age-grade outfit defeated England in their opening match. As a result of that solid display, he kept his place for the rest of the tournament and then was named in the squad for the World Championships in England that summer. He started the opening pool match against Australia and helped the side to another victory with an absolute cracker of a try, taking the ball on a great angle and running in for the score from 50 metres out. He has since continued to climb through the ranks with Scotland Sevens, Edinburgh and now the full national team and he will earn his fourth cap this weekend. For years, Wales and British & Irish Lions winger Shane Williams was constantly asked about his size - or lack of it - and used to reply: “just remember, it's the size of the smile that counts”. The five foot seven-inch-tall flyer also answered his critics by scoring tries by the barrowload at all levels. And Graham - just taller than Williams’ on his top toes - is continuing to show that the ‘wee man’ can pack a punch. And his dad has spoken of his “proudest moment” after watching his son score his first try for Scotland. Towards the end of the Wales game, Graham was forced off with a slight injury, but he still took time out for photos pitch side with a big squad up from Hawick including his dad Ally, mum Leah, sister Rhianna, papa John, girlfriend Louise, auntie Kerry, cousin Corbin and uncles Brian and Alan. 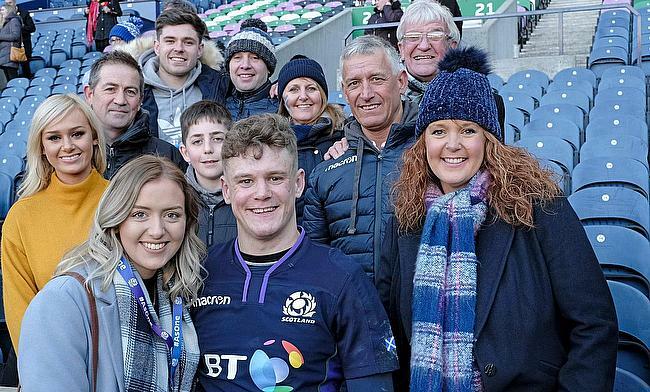 “Having watched Darcy playing since he was just a wee guy in the minis in Hawick and then driven him around the place as he started playing representative rugby, last Saturday was undoubtably the proudest moment for me and his mum Leah,” Ally told TRU. “We always dreamed that he would play for Scotland and he is a really determined character so when he puts his mind to something, he often does it. “It was a tough game with all of the injuries, but Darcy played well and when he scored the try, we were just delighted. “When the ball was being shipped wide, we were not sure if Adam Hastings would go over himself or pass the ball to Darcy, thankfully the latter happened and we were all jumping up and down it really meant a lot to us all. “Coming from Hawick, which is such a proud rugby town, Darcy always looked up to Stuart Hogg when he was younger and it is amazing to see them both in the same Scotland squad now [Hogg is currently out injured]. Papa John Slorance added: “The response from the people in Hawick to Darcy’s success has been amazing and we have been quite overwhelmed by all the nice messages and people crossing the road to say ‘well done’, it means a lot.